CLEARWATER, Fla. - The Phillies took a pitcher in the 24th round of the 1981 draft who actually helped them get to the World Series last year. No, it wasn't Jamie Moyer, although this guy did graduate from high school in 1981, the same year as the Phillies lefthander who still is working in the big leagues at 47. Charley Kerfeld declined the $50,000 signing bonus he was offered by former Phillies scout Eddie Bachman 29 years ago and signed with the Houston Astros a year later as a first-round pick. It wasn't until November 2006 that Kerfeld finally landed with the Phillies, as a special assistant to Pat Gillick, the team's general manager at the time. Since then, he has become a heavily relied-upon member of the Phillies' band of decision-makers. 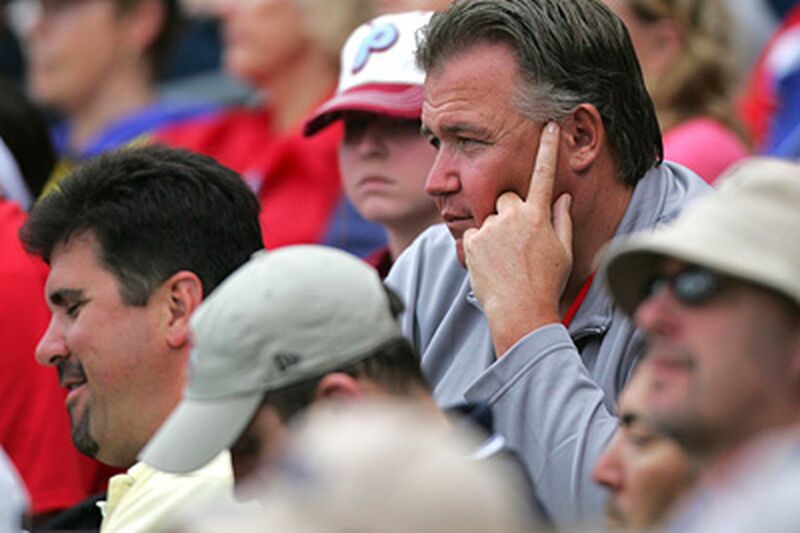 "In a lot of ways, Charley has become my eyes and ears out there," current Phillies GM Ruben Amaro Jr. said. "Obviously, Gordon Lakey has been our major-league scout - and, as far as getting information and the nuts and bolts, there is nobody better. But Charley has the ability and the flexibility to be able to go wherever we send him, whether it's the Dominican or Venezuela or wherever." The Dominican Republic is where Kerfeld ended up last July because the Phillies' starting rotation had been ravaged by injuries and inconsistency and Pedro Martinez was being considered as a solution to the problem. "We were just kind of sitting around in [assistant GM] Scott Proefrock's office and we felt like we were probably going to do something with our rotation because we weren't performing very well at all," Amaro said. "We were like 14th or 15th in the league in the first couple of months of the season. Cole [Hamels] wasn't having a Cole type year. Brett [Myers] had gotten hurt." A Help Wanted sign had gone up at Citizens Bank Park. "Scott said, 'Well, Pedro is still out there,' " Amaro said. "We said, 'Let's take a flier.' "
Kerfeld, who had seen Martinez pitch in the World Baseball Classic in March, was asked to take a flight to look at the future Hall of Famer to see if there was any magic left in the pitcher's 37-year-old arm. Benny Looper, another of the Phillies' assistant GMs, also made a trip to the Dominican to watch Martinez, a week later. "I just thought he was so much better than what we had," Kerfeld said. "I spent a little time with Pedro down there and I got to know the person. I went in with an open mind just to see what this guy was about - and the one thing that came across to me is that he's probably one of the smartest, most intelligent pitchers that I ever met. "I knew his stuff was never going to be what it used to be, but his stuff was plenty good to help us in the five-hole - and pitch higher than the five-hole. My instincts as a scout and ex-player were that this guy can come out and help us." Martinez helped the Phillies immensely, going 5-1 with a 3.63 ERA in nine regular-season starts before delivering solid efforts in two of his three postseason outings, including seven scoreless innings against Los Angeles in Game 2 of the National League Championship Series. "They've never questioned me on anybody I've recommended at the major-league level," Kerfeld said. "This one worked out good. There have been a couple that haven't worked out. But if you don't take your swings, you can't hit the ball." Kerfeld didn't want to say which players he swung and missed on. "I don't want my name on a couple of them, because the people in Philly will find out," he said. "Inside the organization, we know who they are. But any scout who tells you they're perfect, they're a liar. If you don't recommend people and put your neck on the line, what value do you have? But for the 30 good ones, the one bad one will always stick in your craw." Kerfeld, after nine seasons managing various independent-league teams on the West Coast, got his first chance at professional scouting with Seattle in 2002. He was hired by Gillick, who was the Mariners' general manager at the time. "Charley is never afraid to speak his mind," Gillick said. "He's never really bashful to go against the flow. There might be six or seven opinions out there and they are all in the same direction and he might take a contrary opinion. It's not just to take a contrary opinion, but he feels like maybe he sees something different that somebody else doesn't. "Those kinds of guys, they have to have good judgment and they can't be shy to speak their opinion even if it might be in the minority at times." Perhaps the thing that has made Kerfeld so successful as a scout is the failure he experienced as a player. "The thing about the job is I cheated myself as a player - and I'm never going to cheat myself again," Kerfeld said. "I took shortcuts as a player and it probably cost me years off my career. I liked the game, and I liked what happened after the game more than I should have. At one point in my career, I was 15-4 with seven saves and a high-two ERA - and then all of a sudden I forgot what got me there, and some injuries went along with that. "I'm trying to make that up double as a scout. I got a chance with Pat in Seattle and I just wanted to make sure whoever I work for that the GM understands that I'm available 24-7, 365 days a year. That's my job." So how would the Phillies' devoted scout describe the 17-year-old kid the Phillies' drafted in the 21st round of the 1981 draft? "I had hair down the middle of my back, coke-bottle glasses, earrings and tattoos," Kerfeld said. "The only reason I was drafted was because I happened to be pitching against their first-round pick, Johnny Abrego, one day in an American League game and I dominated against Johnny. "They took me in the 24th round and Eddie offered me $8,000. At Thanksgiving, it went up to $25,000 and then by Christmas it was $50,000. I probably should have signed when they offered me $50,000, but I had female problems at the time - a gal I had been dating a long, long time. It was the first girlfriend scenario." Kerfeld didn't sign, but all these years later he has become a valuable member of the Phillies' organization.